For those of you who want some NBA with the NCAA brackets just out (watch out for Pitt in the Final Four, you heard it here first), here is our latest pickup of the night. I know that we have been down on this guy in the past. But there is no way the Hawks can go through a playoff push with only a five-man rotation, and Childress should be the first guy off the bench. Against the defensively-challenged New York Knickerbockers, Childress recorded 22 points on 6-8 from the field (including 1 three) and 9-10 from the line. It also helped that he contributed with 9 rebounds and 3 steals (and only 1 turnover). That is a pretty great line. Childress may not be available in your league, but with some lackluster play recently, he may have been dropped by a frustrated owner. Farid really loves RT21. I think that he is overrated. Still, with Pau Gasol not playing, RT21 scored 13 points on 3-4 from the field and 7-9 from the line with 8 rebounds, 2 assists, and 3 blocks. Hell, if RT21 goes for 3 blocks a game, he could do very little in other categories and be worth owning. It wouldn’t be bad to use a pickup on him if he isn’t gone already. And you gotta love this picture of him below. For daily fantasy basketball pickups, be sure to subscribe to our free RSS feed. I think Farid has the right call on Ronny. I would have grabbed him in my league (not grab as in Devin Harris junk grab, thanks for that photo Patrick…) but the #2 guy (only a few spots behind me) picked him up first.I dumped Varejao for Josh Powell. 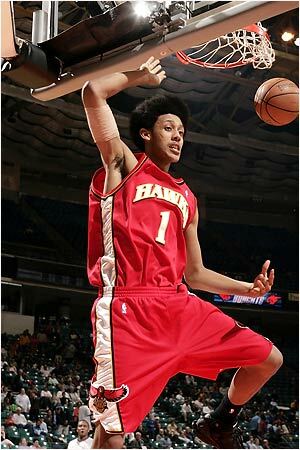 Josh Powell? Yep. I think he’s going to have some value. Of course, Ben over at FantasySportsExperience heavily influenced me — but we’ll see. 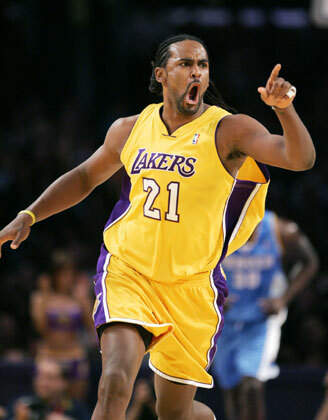 for some reason i just don’t like turiaf. maybe a couple more good games and my opinion will change.